Pittsburgh International Airport (PIT) has catered to craft beer enthusiasts with the opening of Voodoo Brewery on its Concourse C.
The 225ft² pub offers 12 draft lines and a collection of year-round and seasonal brews, including Voodoo Love Child, Wynona’s Big Brown Ale, Good Vibes and White Magick of the Sun. Chips and beelzebub salsa are also on the menu. 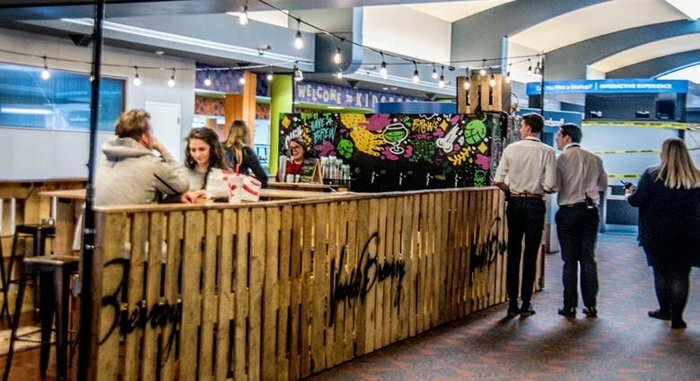 The ‘open air’ pub décor has Voodoo-branded wooden pallets and a graffiti chalk board. The new pub also offers USB plugins. Eric Sprys, chief commercial officer at Allegheny County Airport Authority, said, “The addition of Voodoo Brewing Co. is the latest piece to bringing more of our regional flavor into the terminal. “We’re thrilled to bring Voodoo Brewing to the airport,” added Ben Zandi, president and CEO of Fraport USA, the retail developer at PIT.